the solarblogger: What is Energiesprong? Could this Idea from the Netherlands Crack the Toughest Challenge in Energy Efficiency? Into the gaping hole in UK energy efficiency policy (see previous blog) left by the UK government inaction and disinterest springs Energiesprong, a concept that originates in the Netherlands and could totally revolutionise the way we approach domestic energy efficiency. The finished house should be zero energy - over the course of each year it generates sufficient energy to heat the house, provide hot water and power household appliances. The requirements may be easy to set out, but the technical challenges they present to the construction sector are far from simple. How to cost effectively making millions of individual and unique homes cosy, comfortable and cheap to run. Nothing less than a new era of mass-customised construction is required. The prevailing technical approach to an Energiesprong renovation is for the house to be surveyed externally to millimetre accuracy with laser scanners. 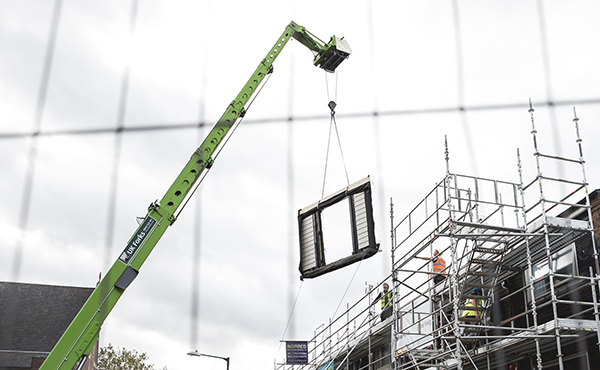 A highly-insulated timber frame cladding system is made in a factory off-site before arriving on a lorry and being lifted into place by a crane and attached to the existing walls. A new roof, almost always covered with solar panels is lifted on top of the existing roof (sometimes even leaving the old tiles in place). In effect you build a whole new house around the existing one. 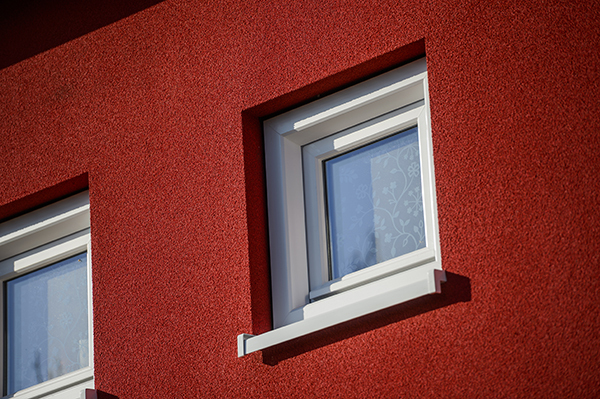 Windows and doors are removed and replaced, and heating systems go electric - typically either heat pump or electric panel heaters, depending on how far the insulation has driven down the space heating demand. Solar thermal, battery energy storage and ventilation may also figure in designs. The fourth and fifth requirements are utterly crucial to the whole thing working, as they make it 'investable' . Residents pay an 'energy services fee' which is the same as their current energy bill, but get a better looking, warmer and more comfortable house. The goal is for the cost savings on future planned maintenance (e.g. window replacements, roofing renewal, heating system replacement) plus the energy services charge to total up to a figure high enough to be able to give financial markets a sufficient return for financing the upfront costs. If this can be achieved, then the scope for expansion of the scheme is effectively unlimited. It works without government support. It is completely scalable and social landlords can raise private sector finance to refurbish their entire stocks of housing. Row of Energiesprong homes, Melick, Netherlands. It is this possibility, of funded deployment at scale that has got the construction industry, social landlords and local authorities so excited about Energiesprong. Consider the challenges, though. At the current cost of energy, Energiesprong UK estimates that the whole refurbishment must be done for around £40,000 per house to be properly self-financing. For this cost point to be reached, serious economies of scale need to be unlocked. Energiesprong UK, and sister organisations in France, Netherlands and other countries aim to create these economies of scale by encouraging social landlords with large portfolios of property to bring forward volume refurbishment programmes and at the same time encourage the construction sector to develop the innovative products and techniques that will be needed to deliver these projects at low cost. This stage could then be followed by a roll-out to owner-occupied homes and even new build properties, where the model might finance the difference between building regulations energy efficiency levels and building to zero net energy. 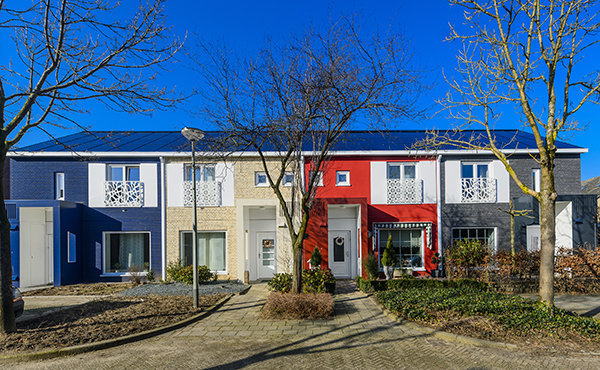 So far, around 2,000 Energiesprong homes have been completed in the Netherlands, of which around 60% were renovations of existing properties and 40% new builds. The first Energiesprong homes outside of the Netherlands have recently been completed in a pilot of 10 homes in Sneinton, Nottingham by Melius Homes for Nottingham City Homes. The pilot programmes so far undertaken have cost more than the £40k target, and so have required top-up funding, but the volumes have been relatively small, predominantly pilot programmes. A couple of observations on current approaches to energy efficiency and government policy arise when considering the great potential from Energiesprong. Many government policies are based on the prevailing concept of a long journey of many small steps. For example the Energy Efficiency Standard for Social Housing (EESSH) in Scotland requires social landlords to lift the energy efficiency of all homes, and it is envisaged that the minimum performance will ratchet up in small steps over time. This approach is not compatible with Energiesprong, for which it would make more sense to set targets for the average efficiency of stock. This would give social landlords the flexibility to refurbish homes to a very high level and work their way through the whole stock year by year. To allay fuel poverty concerns for people living in the homes that get dealt with later on, perhaps all stock should reach a minimum before an average score could be used. Funded schemes, such as 'rent-a-roof' solar could be a complete dead end and indeed prove an impediment to the whole-house approach. 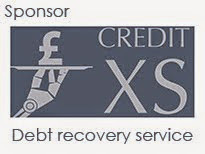 If you want to stick a new, cosy roof over an existing one as part of an Energiesprong refurb, but someone has already signed up to a 'free solar' plan which hands over the roof for 25 years to a financier, then you may find that you cannot remove the panels without paying to get out of that contract. Similar, funded schemes, based on the Renewable Heat Incentive (RHI), for example for biomass boilers, could also prevent progress, as the RHI payment is based on the heat provided, which would be curtailed in a more energy efficient building. Before and After. 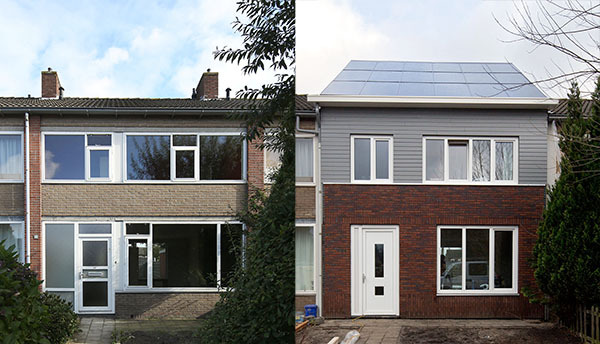 Energiesprong refurbishment for Lefier Housing Association in the Netherlands. The main difference between Energiesprong and previous attempts at improving energy efficiency is the potential it provides for the redevelopment of entire streets and localities. The whole outside of the house is renewed, and as the images show, the improvement can be extraordinary. The scope for regeneration of tired old housing estates has got social housing providers and local authorities really interested. Suddenly we're not only talking about energy saving, we're talking about regeneration and investment in the value of housing assets, funded by energy savings. Consequently, it is possible that even before the £40k/house cost target is reached, significant projects can go ahead by combining with funds earmarked for the redevelopment of deprived areas. Either way, the possibility of regenerating whole areas, with funding either partially or wholly paid for from future savings on energy bills is revolutionary and well worth reaching for! That's an interesting posts on a great idea of energy saving. I write reviews on Papermasters exploring such topics.